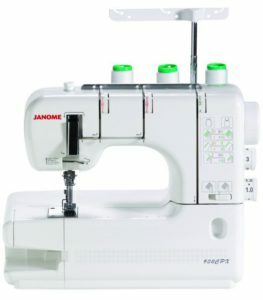 Janome CoverPro 900CPX will be a great addition for your sewing business. It does skip stitches occasionally over thick seams though. Janome 900CPX is a cover stitch machine designed for sewing professional looking hems. To make threading easy, thread patterns are shown on the thread guide which can be accessed by removing the accessory storage compartment. A slider is provided for adjusting the tension. You can adjust the stitch length and differential feed using the dials provided on the right hand side of the machine. Stitch length can be adjusted between 1mm and 4mm. Stitch width up to 5mm. Differential feed ratio can be set from 0.5 to 2.25. For hemming small areas, you can convert the machine into free arm. A quick reference chart is provided on the front of the machine for stitch selection. CoverPro 900CPX comes with Janome’s own Seam Tightening System (STS) which reduces slack in the looper thread, giving you tight, flat, and sturdy stitches on any type of fabric. This cover stitch machine can offer a maximum of 5mm wide double-needle cover stitch and a chain stitch. The powerful motor can deliver 1000 stitches/min. The machine weighs around 20 pounds. It comes with an included softcover as well. My first impression is, it looks pretty good. The machine is very easy to set up and thread. You really don’t need any previous experience to work on this machine. The stitches come out the way you want it to be (like those you see on the store bought items). There are no issues like stitch skipping or thread breaking (there is an exception, see limitations). CoverPro 900CPX uses standard sewing machine needles, which is a great convenience. This is a machine that will suit those who do daily work on it. It can take the work load of a busy seamstress without stalling. When compared to other popular home cover stitch machines, I feel this machine runs smoother. It is quieter as well. Like every home cover stitch machine, CoverPro 900CPX at times skips stitches over thick cross seams. This is pretty much the case with any cover stitch machine designed for home use. So you can’t really complain. Using a hem tape will fix it. An option to do narrow hems would have made this machine perfect. Yes. More so, if you own a small business. CoverPro 900CPX can handle huge workload. It offers great quality for sure. The Janome coverstitch 900 CPX is an innovative design based on the marriage of an industrial-style cover hem machine and a convenient home machine to bring you the perfect home coverstitch machine. 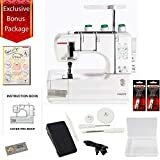 The resulting union has produced the Janome 900CPX, a high-speed, long arm, heavy-duty cover hem machine that looks and operates as easily as a sewing machine but with wonderful coverstitch results.